You may recognize me from Twitter or other SEO communities around the web like SEOmoz. If not, nice to meet you! I run Evolving SEO in Massachusetts. Just like to thank Tom Critchlow for offering me the opportunity to guest post on the Distilled site. This is my first guest post ever. I hope I fulfill your expectations! 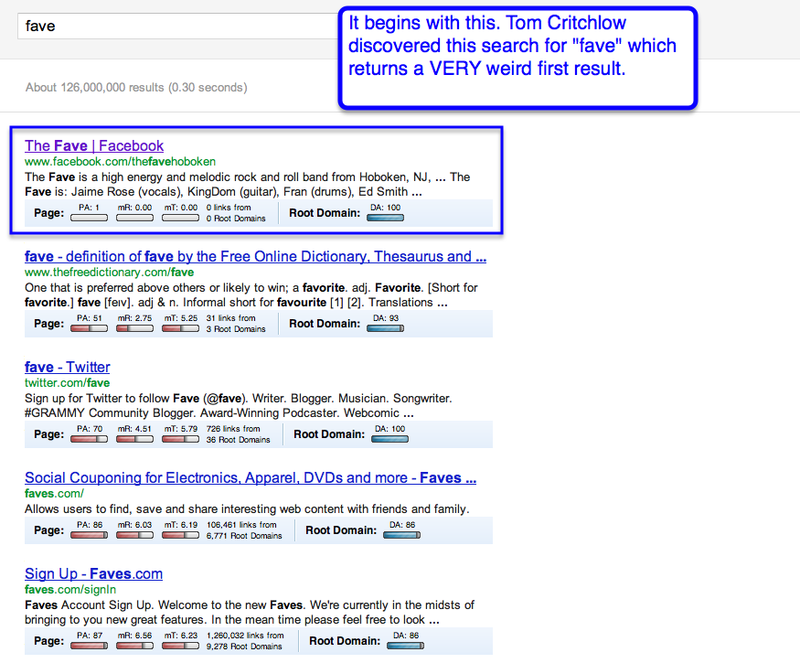 Tom Suggested I Write About This Google Search For "Fave"
Did the result have something to do with "fave" being the beginning of a misspelling for "facebook"? Was there something else that SHOULD rank for "fave" that wasn't? How COULD something else rank for "fave" if you wanted it to? And importantly, what can we LEARN from this and apply in practice? I love these sorts of indexation mysteries, so naturally I thought it was a fantastic idea, thanks for letting me take the wheel on this one Tom! 1. Does this matter? - If there's not many searches for "fave" or search intent is too generalized across users, than it doesn't matter so much we're getting weird search results. 2. WHY do things rank like this? - Once we know it matters, I want to know what's causing it to rank like that? There must be something beneath the surface. 3. What can we learn from this? - Finally, it a cause is identified, how can we learn from this? What can we learn about the SEO research/diagnostic process? And are there any takeaways for leveraging the findings to apply to real life situations? Where Can You Find Me Next...? March 19 - 23 - SES NYC. I will be part of a sponsored session doing a live site review and a case study. Exact day/time TBD. April 2nd, 2012 - I will be at LinkLove Boston / Atlantic as an attendee. You should come!! !